I SHOT THS VERSION OF "THE BANK ROBBERY" AT FLAPPER'S COMEDY CLUB IN ABOUT 2014. A PROMOTER TOLD ME HE WANTED TO SEE A VIDEO OF "THE BANK ROBBERY" SHOT INSIDE A CLUB. I HAD PREVIOUSLY SHOT A VERSION ON VENICE BEACH, BUT I DIDN'T HAVE A VERSION SHOWING THE ACT INSIDE A CLUB. 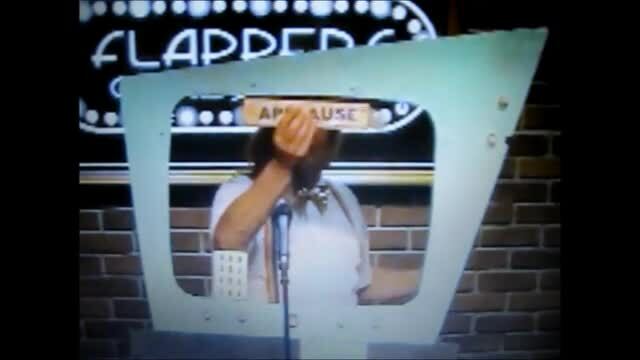 SO, I ARRANGED WITH THE OWNERS OF FLAPPER'S COMEDY CLUB TO SHOOT THIS VIDEO AT FLAPPER'S. I RIPPED THE HOUSE DOWN. THE NEXT COMEDIAN WAS LIKE, "NOW I'M GONNA' HAVE TO WRAP MY HEAD AROUND HOW I FOLLOW THAT LAST GUY!" AS USUAL, THE NEXT COMIC COULDN'T FOLLOW ME. AS USUAL, I WAS FIRED FROM THE CLUB. FLAPPER'S NEVER HAD ME BACK.